Israel's President Shimon Peres has denied a report which claims there was an alleged nuclear pact between Israel and apartheid South Africa. Documents to be published in a new book show Israel agreed to give South Africa nuclear weapons in 1975, the Guardian newspaper has reported. 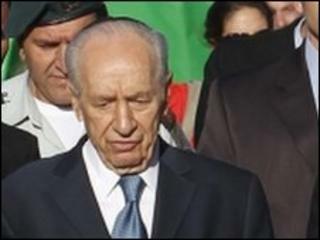 Mr Peres was Israel's defence minister at the time and was named in the Guardian article. The news comes as tension over nuclear weapons in the region is increasing. Mr Peres' spokeswoman, Ayelet Frisch, said there was "no basis, no foundation in reality" for the reports. "We regret that the paper used in the story documents by the South African government officials rather than documents that present the facts," a statement given to the BBC said. "Israel did not conduct any negotiations for the sale of nuclear weapons to South Africa and none of the aforementioned documents are original signed Israeli documents that confirm the existence of such talks of such negotiations." The president is going to write a letter to the Guardian demanding "the right facts" be reported, the statement said. The Guardian reported that the previously secret documents, unearthed by American academic Sasha Polakow-Suransky, provided the first official documentary evidence of the existence of Israeli nuclear weapons. Israel operates a policy of "ambiguity" over its nuclear programme, but in 1986 Israeli nuclear technician Mordechai Vanunu revealed details of a nuclear reactor in Israel. The Federation of American Scientists estimates Israel could have produced up to 200 nuclear weapons. The Guardian also said the documents could undermine any claim that Israel might make that it is a responsible country and can be trusted to hold nuclear weapons, while Iran is not. The alleged deal also indicates the strength of the relationship between the Israeli government and apartheid South Africa, the Guardian said. The secret documents were declassified by the post-apartheid South African government. They include minutes of secret meetings between officials of both countries - one cover note is apparently signed by PW Botha, then South Africa's defence minister, and Mr Peres. They refer to an offer of Israeli weapons "in three sizes" this is thought to refer to conventional, biological and nuclear weapons. The original documents state the "very existence of this agreement" were classified as "secret and shall not to be disclosed by either party". But the evidence contained in the report could be argued to be circumstantial, the BBC's Middle East correspondent Tim Franks says. A previously declassified memo written by South Africa's military Chief of Staff laid out the benefits to South Africa of acquiring Israel's Jericho ballistic missiles with nuclear warheads attached. That memo was written on the same day as the meetings between South Africa and Israel in which Mr Peres now denies were negotiations for nuclear weapons. In the end, the South Africans rejected the deal because it was too expensive. They developed their own nuclear weapons programme, which was dismantled between 1983 and 1993. Could Middle East be nuclear-free?